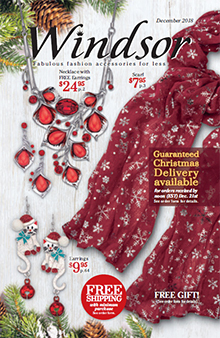 Chic fashion jewelry at discount prices, from bracelets and necklaces to stylish rings and watches from the Windsor Jewelry catalog, part of the AmeriMark family of catalogs. Free Shipping will be applied automatically at checkout on the Windsor Collection website. Affordable Fashion Jewelry - Look like a million bucks without having to spend it, with fabulous fashion jewelry for less. No matter if you're a fan of gold tone, silver tone or sterling silver styles, you'll have access to a virtual treasure trove of inexpensive options. Choose from beautiful cuff and stretch bracelets, elegant clip and hoop earrings for pierced or unpierced ears, classic and whimsical rings, gorgeous necklaces and pendants, charming lockets and pins, fashionable watches and sets that will make a stunning gift for any occasion. Men's Jewelry - The Windsor Jewelry catalog delivers a dazzling assortment of his and her bling with a collection of styles designed especially to suit him. Browse a masculine selection of men's wedding bands and watches, bolo ties and tie clips, money clips, initial rings and ID bracelets, with most selections priced under $20. Sets - Give the gift of exquisite gems and jewels that will add a glamorous touch to any ensemble. You'll find a sparkling selection of affordable fashion jewelry sets and versatile collections for day or night, including matching necklace and earring sets in silver tone, gold tone or sterling silver settings. Whether you're shopping for yourself or a loved one, you'll find exquisite options from bridal ring sets for the big day to fashion watch and chain sets to mix and match every day. Shop by preferred metal, gemstone, theme or by price. Seasonal & Themes - Commemorate the holidays with wearable trinkets and treasures that will help you celebrate and embrace the spirit of the seasons. Choose from a wide assortment of festive seasonal jewelry for Christmas, Halloween, Easter, St. Patrick's Day, Valentine's Day and the 4th of July, as well as Autumn, Winter, Spring and Summer selections to interchange and show off all year long. Browse other popular themes including adorable animal and heart shapes, feminine floral and Victorian jewelry, crosses and religious themes, Chinese symbols, and antique cameo styles that are in a word, timeless. The Windsor Jewelry catalog makes it easy and affordable to populate your jewelry box, featuring exceptional pieces and sets offered at even more exceptional prices.